FSR took to the classroom for its long-term support of the United Way of Passaic County’s ongoing “Backpacks 4 Kids” school program. Recognized as the largest initiative of its kind in the region, Backpacks 4 Kids helps local students get much-needed supplies for class. Each year, FSR joins other local businesses and the United Way of Passaic County in filling 50 backpacks with classroom essentials, such as notebooks, erasers, pens, pencils, and crayons, along with 50 lunch boxes, in their efforts to help local students prepare for the school year ahead. 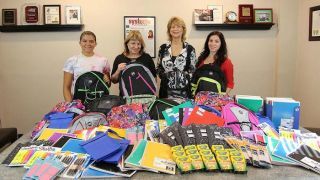 Part of a greater United Way initiative and a combined effort between area businesses, the Backpacks 4 Kids mission is to send students back to school in the fall equipped with the tools they need to succeed.